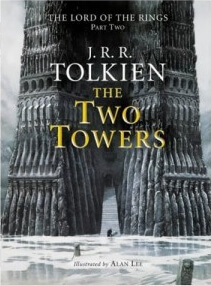 The Two Towers is the second book in The Lord of the Rings trilogy. The trilogy is about a hobbit named Frodo and his quest to destroy a mysterious and evil ring crafted by Sauran, who is a mysterious evil character who will stop at nothing to get back his ring. This book tells of how the members of the Fellowship of the Ring fared after its breaking and what deeds they went on to perform. The beginning of the book tells of the death and funeral of the brave man Boromir, and of the capture of the young hobbits Merry and Pippin by orc soldiers. The hobbits were taken across Rohan by this band of orcs. Aragorn, Gimli, and Legolas, the last three remaining members of the Fellowship, set off in search of their little hobbit friends. On their way, the three run into a troop of the riders of Rohan, who recap the tale of a bloody battle between them and the orcs. Desperately fearing their friends to be among the slain orcs, Aragorn, Gimli, and Legolas make haste and arrive at the battle field. The hobbits were quite alright. With the aid of Elf disguises, they made it safely away from the orcs, avoiding the battle and making it into the woods of Fangorn. There they met Treebeard the Ent, and witnessed an Entmoot, or gathering of Ents in which they agreed to march to Isengard to destroy Sarumans stronghold. While this was happening, Aragorn and his companions came to the forest to search for the hobbits, to no avail. Instead they found Gandalf, who was thought to have fallen in Moria. After recapping his adventures in the depths of the mine, Gandalf leads them to Rohan, to where they request the aid of Rohan’s wariors in the war against Isengard. Aragorn and his company decide to make for Helms Deep instead of going to Isengard. At Helms Deep there is a miraculous victory over the orcs and wild men. After this victory they make their way to Isengard, only to find it already in ruins, thanks to the Ents. Saruman was trapped in the tower of Orthanc and refused to repent when Gandalf approached him. Wormtongue, one of Saruman’s servants and spies, drops a round stone from a high height intending to hit Gandalf. Pippin the hobbit retrieves it, just before it rolls into a puddle. It turns out that this is one of three surviving palantiri, seeing stones of Numenor. Near the end of this part, the army spies a winged ringwraith flying high in the sky. The army rides to Minas Tirith, to prepare for war. The second part of the book tells of Frodo and Sam and their voyage to mount Doom. With the aid of Gollum, they make their way to Mordor and attempt to get in. All known ways are blocked or guarded, and all hope is seemingly lost until Gollum remembers the spider pass, and a way to Mordor. In Mordor there they run into trouble. Frodo is killed by a monster named Shelob, and Sam must assume the burden of the ring and take it to mount Doom, alone. I discovered Tolkien as an adult, and absolutely fell in love. I have read the Trilogy, The Hobbit, the Silmarillion, and have attempted to dig my way into some of his other related works, although they are so involved I had to put them down and wait for another day. I am an avid reader, especially of fantasy fiction, but Tolkien ranks as number one to me, far above any competition. In fact, I find myself judging every fantasy book that I read by Tolkien’s work! I also love Tolkien and his works. They are simply marvelous. 🙂 Thanks for commenting! Firezdog…One important thing to remember about Tolkien to remember that he does NOT write allegory, or even present ANY parallel views of the bible. He was a friend of C.S Lewis, and absolutely hated the Narnia series because of the blatant allegory. He does however intentionally bring out good principles in his books. One thing I found just slightly annoying about ‘The Two Towers’ was that book three, the first book you read, was all about Merry, Pippin, Aragorn, Legolas, Gimli and Gandalf, which was very interesting but a bit frustrating when you wanted to know more about the main quest with Frodo and Sam. Their adventures didn’t begin until book four, which made book three a bit hard to read. I would have prefered it if Tolkien had merged the stories together a bit more, but I didn’t mind too much, the book was still a great read. I wonder… just out of curiosity, does anyone know why Tolkien hated allegory? It doesn’t seem to make much sense to me, seeing as Jesus spoke in parables a lot and everything. I found that bit slightly frustrating myself. I wish that what he told you had come in shorter bursts, so you could find out more sooner. It was a little confusing to have to jump back after awhile, but that made it a real page-turner.